Folding fans, or abanicos, were considered must-have accessories in nineteenth century Spain. For women, they served as important tools in courtship, the ‘language of the fan’ expressing everything from ‘come hither’ to ‘don’t bother’ to hopeful admirers. The imagery painted or printed on fans also carried important messages. Many celebrate national events, such as the signing of the constitution in 1812, or aspects of Spanish culture. This fan, lithographed with pasted spangles, features both bullfighting and dancing scenes, perhaps suggesting parallels between the two. The dancing scene on the left, labeled ‘eighteenth century,’ is evidently more debauched than its counterpart, with bottles at the guitarist’s feet and the dancers holding hands. The scene on the right, labeled ‘nineteenth century,’ is more refined, with a female guitarist and the couple at a demure distance, perhaps suggesting the increasing sophistication of Spanish culture. 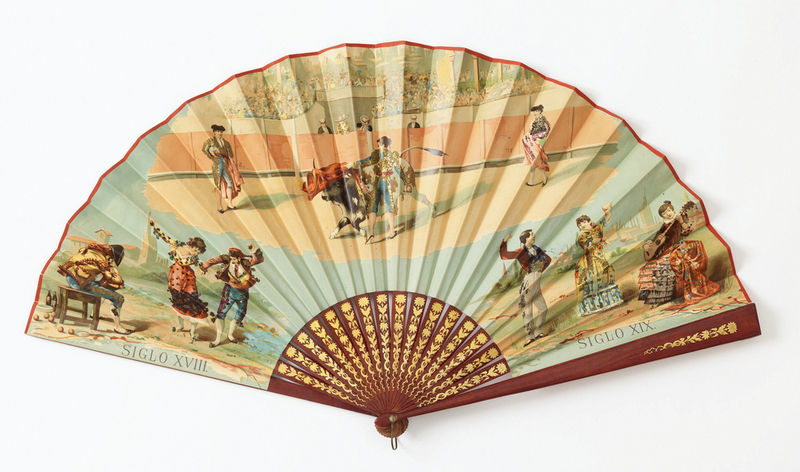 Bullfighting scenes were common on souvenir fans, and this fan may have been made for the tourist market, which was buoyed by the 1875 opera Carmen and the publication of numerous travelers’ guide books. Pleated Fan, Spain, late 19th century, paper leaf with chromolithograph, pasted with spangles, painted and gilded wood sticks, Bequest of Sarah Cooper Hewitt, 1931-6-148.